Quick overview A practical and comprehensive guide to researching, preparing and writing a dissertation at Masters level. 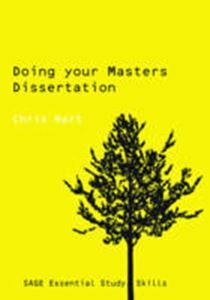 Doing Your Masters Dissertation is a practical and comprehensive guide to researching, preparing and writing a dissertation at Masters level. The book adopts a well-structured and logical approach, and takes the student through all the stages necessary to complete their research and write a successful dissertation. Written in an engaging and accessible manner, this textbook is an essential resource for postgraduate students across the social sciences required to complete a Masters dissertation.